LA JOLLA, Calif. – Major League Baseball All-Star and USC All-American Morgan Ensberg has joined the UC San Diego baseball program as an assistant coach. The announcement was made Monday by Triton head coach Eric Newman. 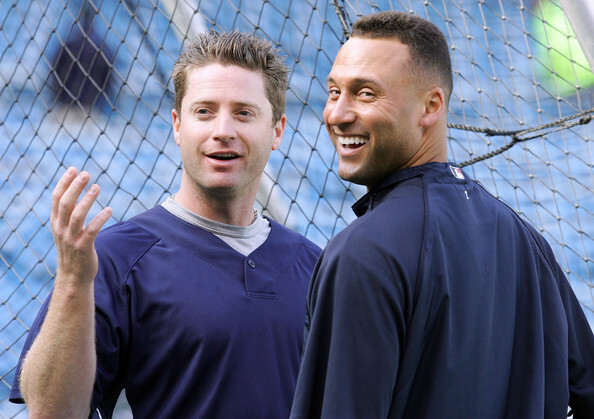 Morgan Ensberg (left) chats with Derek Jeter during his playing days. Ensberg’s primary responsibilities will include working with the Triton hitters and infielders, as well as running camps. No stranger to Southern California baseball, Ensberg graduated from Redondo Union High School in Redondo Beach, played for the Trojans at USC and spent time as a member of the San Diego Padres. Drafted by Houston in the ninth round of the 1998 Major League Baseball Draft, Ensberg made his Astros debut on Sept. 20, 2000 and was with the team until 2007. His most memorable season came in 2005 as he was named a National League All-Star and helped lead Houston to a World Series appearance. He posted career-highs with 149 hits, 86 runs, 30 doubles, 36 home runs and 101 RBI over 150 games. Also in 2005, Ensberg was honored with a Silver Slugger Award for the best offensive third baseman in the National League. He finished fourth in league MVP voting. In July of 2007, Ensberg was traded to San Diego, where he homered twice in his debut for the Padres. He then became a free agent and signed with the New York Yankees in late January of 2008. He played his final Major League game on May 25, 2008 as a Yankee. While at USC, Ensberg won a national championship in 1998. He was tabbed an All-American as well as the team’s MVP and still stands as the only Trojan to ever amass 20 home runs and 20 stolen bases in a single season. Ensberg can be found among the top-10 in 15 offensive categories in USC’s record book. Following his eight years in the big leagues, Ensberg returned to USC in 2010 to finish earning a finance degree. He also served as an assistant coach with the Trojans in 2010, working with the hitters and infielders and teaching base-running skills. Currently, Ensberg is also a college baseball analyst for ESPN and co-hosts MLB Roundtrip, broadcast nationally by SiriusXM Satellite Radio. UCSD, ranked No. 1 nationally for part of its 2011 campaign, made its fifth straight appearance in the NCAA postseason after winning its third consecutive CCAA regular season and tournament titles. The Tritons advanced to the Division II World Series in 2009 and 2010 and played in the national championship game in 2010.